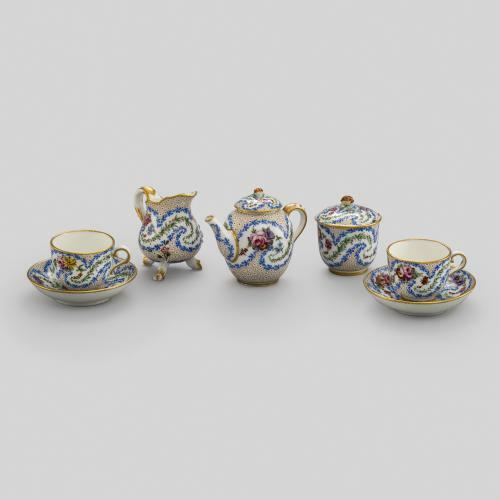 The Sèvres porcelain factory specialised in the production of soft-paste porcelain which lent itself to the decorative effects of enamel painting and gilding. 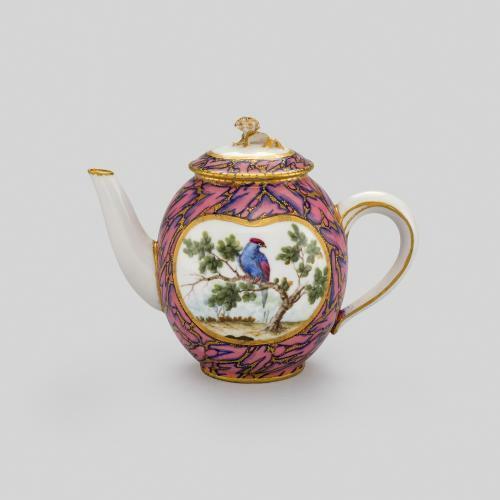 The type of colourful decoration which can be seen on this boîte à thé is known as ‘frise riche’ or ‘frise colorée’ and was very fashionable during the 1760s, particularly among aristocratic ladies. The decoration of this canister was undertaken by Louis-Jean Thévenet, a well-known painter at the factory who specialised in painting flowers. The tea canister may have once belonged to a larger tea service decorated in the same way. It has a cork stopper on the lid which would have made the container airtight, keeping the tea leaves fresh. The small size of the canister reflects the high price of tea in Europe during the middle of the 18th century.